To see the latest from Odyssey Golf, please visit our Odyssey putters page. In the past, putter design innovation has mainly favored the mallet style. 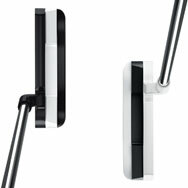 For 2013, however, Odyssey has reinvented the blade putter with the Versa series. Like many putters, the Versa has an alignment guideline, but its new Visionary High Contrast Alignment Technology takes a more comprehensive approach to achieving the perfect putt. Each Versa putter has a black-and-white finish that turns the entire putterhead into an alignment aid. This was an unexpected breakthrough for Odyssey. While developing a multi-material putter with alternating black and white layers, Odyssey's design team realized that while their initial concept was too expensive to produce, the high-contrast layers allowed the player to clearly see the proper face angle throughout the stroke. The layers create a magnified guideline runs perpendicular to the target line instead of parallel, which is the position used by most other putters. By matching the alignment of the face instead of working against it, the Versa's guideline makes it easier to square the face and make more precise putts. And if you're wondering just how important precision is to putting, Odyssey's studies have shown that a face angle with just a single degree of error eliminates a golfer's chances of sinking a 12-foot putt. The revolutionary Odyssey Versa series includes #1, #1W, #2, #7, #9 and 2-Ball models for right-handed golfers and #1, #7 and #9 models for lefties. The Versa also comes in two color schemes: black/white/black and white/black/white (except for the x2-Ball model, which only comes in white/black/white.) All the putters also include an updated White Hot insert for optimal sound and feel. With their remarkable performance and striking looks, these putters are sure to make a lasting impression.